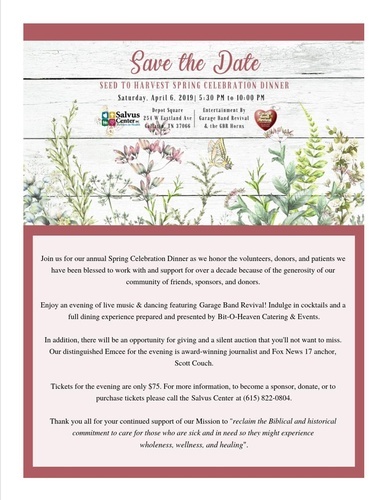 Join the Salvus Center for their annual Spring Celebration Dinner as they honor the volunteers, donors and patients they have been blessed to work with and support for over a decade because of the generosity of their community of friends, sponsors and donors. Enjoy an evening of live music & dancing featuring Garage Band Revival! Indulge in cocktails and a full dining experience prepared and presented by Bit-O-Heaven Catering & Events! In addition, there will be an opportunity for giving and a silent auction that you won't want to miss. The distinguised Emcee for the evening is award-winning journalist and Fox News 17 anchor, Scott Couch. Tickets for the evening are $75. For more information call the Salvus Center at 615-822-0804.